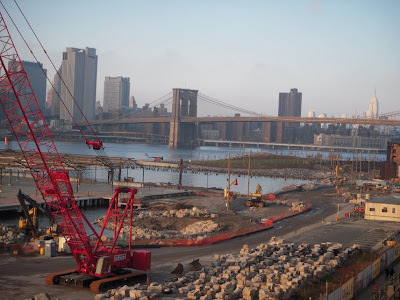 The public is being further titillated by the projection that spurs having been kicked so that the first phase of the long-delayed Brooklyn Bridge Park will be open by December, just two months after the mayoralty election. Really? Notably, much like the Times advises public officials to do in the case of Moynihan Station, the city is now suddenly moving Brooklyn Bridge Park forward (we’ll gauge how fast when December finally rolls in after the election) because it is setting the extraneous focus on development aside. It turns out that we didn’t actually have to wait for December to find out about the Brooklyn Bridge Park opening. We didn’t even have to let the election month of November conclude to find out. The mayoral election was November 3rd. 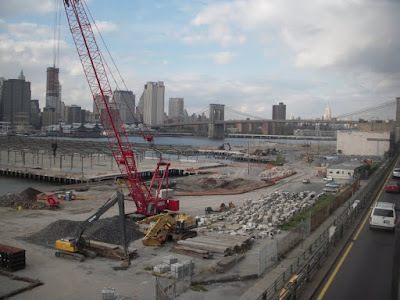 On November 24th, a mere 21 days later, the Brooklyn Eagle ran a brief story that the opening of Brooklyn Bridge Park’s Pier 6 is being postponed. Now we are told that “It won’t be ready until spring.” (See: B’klyn Bridge Park Pier 6 Opening Postponed, by Brooklyn Eagle, 11-24-2009.) The story said only that Pier 6 won’t be open in December but since the story said that the reason that the opening is being delayed is “because they say a harsh winter could damage the facilities” it is entirely possible that we shall soon find out that the reasoning applies equally and that the opening of Pier 1, the other pier that was promised to be opened in December is also being postponed. What a difference a matter of weeks can make if it takes you from pre- to post-election. We found out more quickly, only a week after the election, that Bloomberg was cutting the city budget almost 12%, the steepest cut since the cuts in response to the 9/11 crisis. 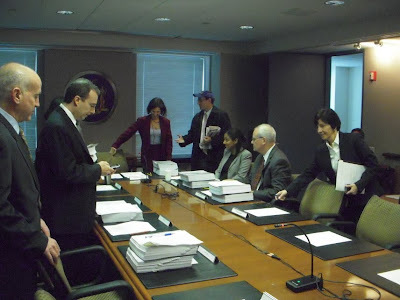 (See: Bloomberg budget ax will cut to the bone, by Sally Goldenberg and David Seifman, November 11, 2009 and Mike's budget chopping spree, by Sally Goldenberg, November 17, 2009.) The cuts applicable to nearly all agencies were announced to take place in two phases (does that make either of them seem smaller? ): 4% in fiscal year 2010, and 8% in FY 2011. But this was the announcement that was immediately post-election. Does anyone want to bet that the announcements of how much is actually being cut will also occur in two phases with additional cuts being announced in January when more serious budget deliberations are underway? When the Bloomberg administration announces the additional cuts, can they then get away with saying that they are just a percentage adjustment of the figures previously released or will the press add it all up together and announce that the cuts are 15%+ (or whatever it is) in cuts to the budget announced since Bloomberg won the election in November? No matter that the Times’ last projected estimate was on the high side, it is still became a case of “never before in history” in many ways quite a while ago: Never has anyone in the United State of America spent so much of their personal money to hold political office, never was NYC’s mayor the wealthiest man in the city let alone become such with a multi-fold increase in wealth while serving in the office, never has a mayor had so many mind-boggling conflicts of interest with a personally-owned company that does business with so many of the same companies that the city itself has transactions with. No matter as well, because while our best estimate was that Bloomberg may have spent $102-105 million on direct campaign expenditures, these direct expenditures were dwarfed by his indirect campaign expenditures such as political contributions to buy endorsements ad charitable donations for political purposes. Counting those, we have noted, the total expenditures could be more on the order of $1 billion for Bloomberg’s third term. 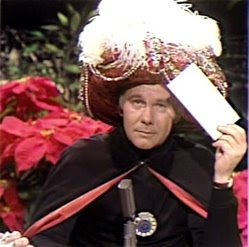 As our prediction on Bloomberg’s campaign spending was fairly dead-on accurate, let us try a few more predictions to duel with the guile of the prettifying before-the-fact promises that have been offered by the mayor. Try this one on for size: Columbia University will announce that it is deferring its plan to develop the swath of West Harlem for at least five years and at the same time is likely to announce that it is having problems technologically effecting the Jules Vernian giant underground bathtub basement that it used as a rationale to seize property through eminent domain. When will Columbia announce this? Not during the pendency of the litigation they are currently trying to win in order to uphold their abuse of eminent domain. They will hold back on the announcement as long as they can, perhaps hoping that by struggling longer with the bathtub technology and maybe shifting to a new architectural team they can conquer the problem before they have to acknowledge failure. The reason that Columbia won’t announce anything like this during the pendency of the litigation is because litigations involving state agencies these days are more than a little like elections: Up-front government officials and the real estate development entities they go out of their way to assist are willing to say anything to win a lawsuit in the belief that once they have won it makes little difference that what they represented and promised wasn’t really true at all, irrespective of subsequent events disclosing the truth. 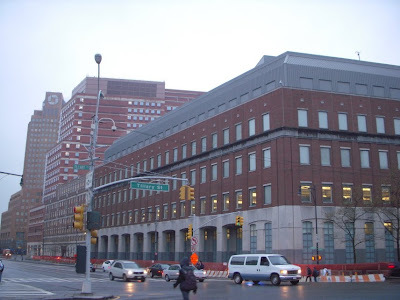 Witness the spectacle of that portion of the Atlantic Yards litigations that the Court of Appeals, the state’s highest court, just embarrassed itself with. 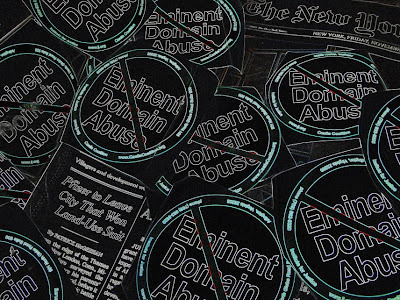 The court managed to uphold a terrific abuse of eminent domain by deferring to a fairy tale version of the facts cooked up by state officials in service to the monopoly-seeking subsidy collector involved (Forest City Ratner). A key mechanism they used to do this provides an amazing example what we are talking about: The court based their decision on a “record” of non-facts that was officially closed as of late 2006, while they ignored conspicuous subsequent events that have continually demonstrated how false the facts of that “record” are in almost every respect. 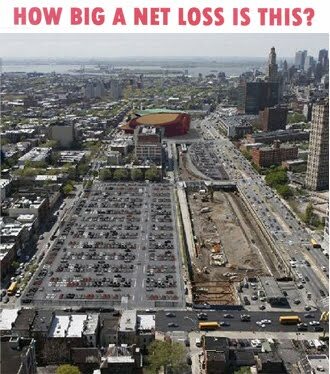 Right now there are many litigations going on in efforts to stop Bloombergian real estate development: the aforementioned challenge to the Columbia University expansion, Atlantic Yards (a good several law suits), Willets Point, the Rudin/St. Vincent’s sell-off of the Greenwich Village Historic District, and the documented lying of finagling public officials on Dock Street. Many of these lawsuits involve the same conundrum of who are the courts going to believe, public officials creating a record of fictitious predictions or the contradicting realities that emerge. We won’t try to predict the outcome of all these litigations, but we will predict something else. While Bloomberg (if not stopped by lawsuits) may succeed in creating mega-project holes in the ground around New York, he will not in his third term as mayor succeed in creating successful developments to fill those holes. It does not seem to us that Bloomberg (nor either his cohorts in development malfeasance) is a man to whom the electorate should be giving grants of power based on prettifying prognostications of what his destructions will lead to, whether those prettifying predictions come pre-election, pre-City Planning Commission, pre-City Council approvals, or pre-court litigations. Global warming, health care reform, complex scams to transfer wealth to already rich politically connected subsidy seekers: It can all get quite complex and the vested interests that oppose the public good know that they can tranquilize the public into soporific political inaction if they confuse the debate sufficiently. Health care reform is a case in poignant point: What should have been a relatively clear dialogue about what was good economics and best for the people has bogged down in confusion, with polls showing a shift. Initial strong support for health care reform has ebbed as Americans are increasingly misled and bewildered by manufactured non-issue, like “death panels.” Democrats like New York Senator Charles Schumer are attempting to interject clarity into the discussion, but politicians who are compromised by their inconsistencies have trouble delivering a clear message. Remember the amount of money spent to create public confusion is immense. We bring this up because this week we found Senator Schumer talking about an issue that is near and dear to our economics-loving heart: The evil of monopolies. No dummy, Senator Schumer is apparently quite aware that the issue should appeal “left, right and center” across the entire political spectrum. Problem is that Senator Schumer has a monopoly-supporting skeleton in his closet, one we have been speaking out against strenuously: Forest City Ratner’s proposed mega-monopoly in Schumer’s hometown of Brooklyn, New York. Jeepers, not only is Atlantic Yards in Schumer’s own borough, he might even be able to see it from where he lives in nearby Park Slope. Schumer can’t dodge knowledge of the ugly details of this scam. Here’s the reason we need a public option. And we do, we very much do. The insurance industry is about the most highly concentrated industry in the country. In many states eighty-one percent of the insurance is by one company. In forty states two companies dominate. When there is no competition or very little competition, every economist left, right and center will tell you, the costs go way up. And that’s what’s happened here. So you need to inject some competition into the insurance industry. The best way to do that is a public option. And the program that we’ve put together is set up by the government, but then it’s on its own. There is no intent for it to compete unfairly against private insurance. . . . But I came up with the idea and the HELP Committee adopted it as well of a level playing field public option. Schumer says he is assuring his more conservative Democratic colleagues that the public option included in the Senate bill is "modest" and not the first step in a government takeover of the insurance industry. 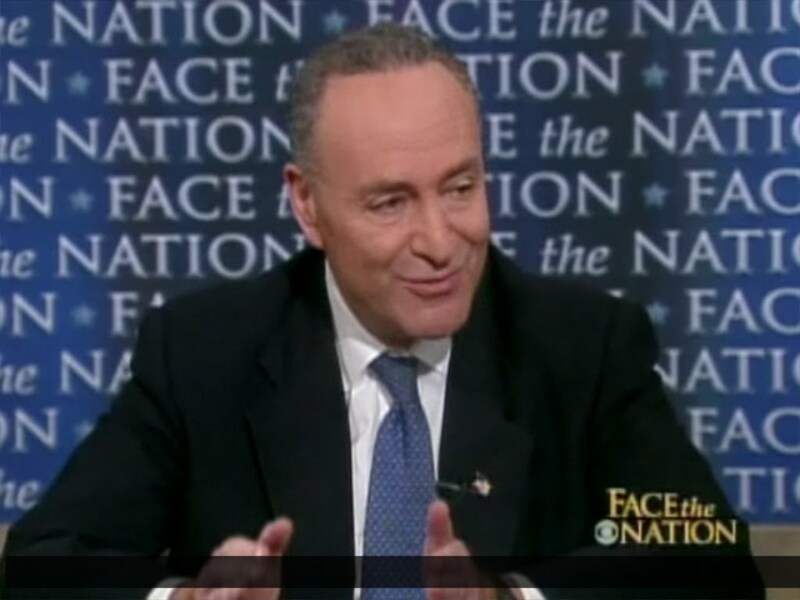 Schumer is also reminding fellow Democratic senators that the bill would allow states to opt out of the public option. He asks that they not prevent his constituents in New York from getting the public option they desire. 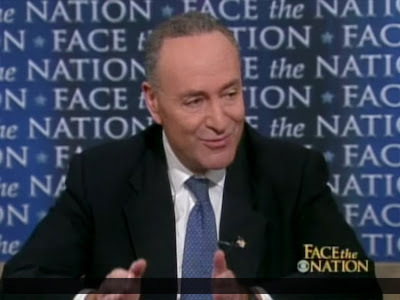 Schumer: Does He or Doesn’t He? Let me answer that. First the Lewin study, which Jon cites is widely discredited for one good reason--they’re fully funded by United Health, a health insurer. Schumer went on to counter that the appropriate study figures to reference should be those of the Congressional Budget Office because “they’re not funded by anybody. 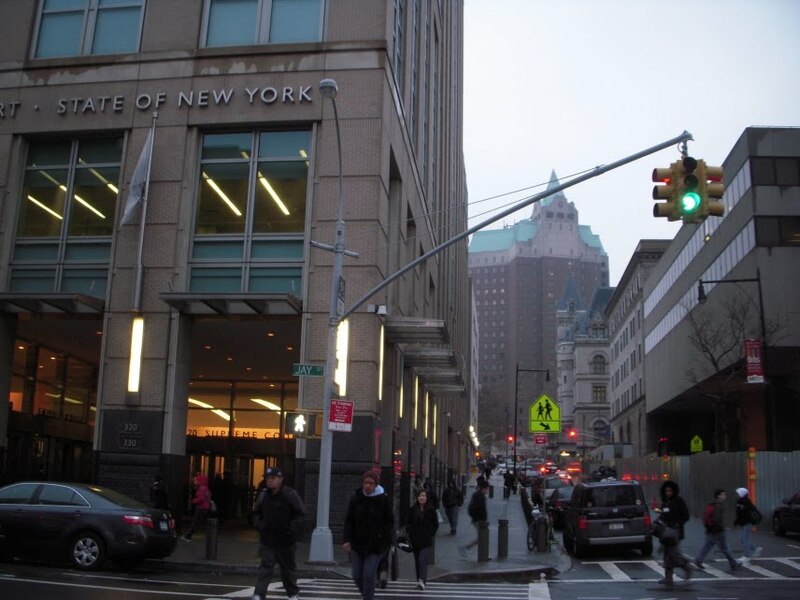 They’re impartial and we both go by their readings.” Promoting the study of the CBO because they are impartial (which is definitely a good thing) is like, in the case of Atlantic Yards, promoting the figures of the NYC Independent Budget Office for the same reason: that they are impartial. These findings of the IBO which Bloomberg and the state agencies in service to the developer Forest City Ratner have summarily rejected says that the basketball arena those agencies are about to finance for the developer will be a $220 million net loss to the public. That doesn’t leave Schumer with much reason to be supporting Atlantic Yards. It sort of forces one to go back to our story about how when the Senator was cornered about the subject of Atlantic Yards in a neighborhood barbershop he fled, saying that he had just accepted what ACORN told him about the project. (See: Monday, January 12, 2009, The Prospect of Caroline Kennedy as a New York Senator.) We previously discredited the way that ACORN sold out the community on Atlantic Yards but these days reliance on ACORN is not what politicians appealing to the left, right or center should want to be doing, given all the more recent events that have conspicuously brought to fore ACORN’s perpetually self-serving nature. “Speaking with a forked tongue” was once frequently used as a term to describe lying. Whether or not it is strictly lying, speaking of the evils of monopoly as you follow a forking path, where sometimes you support monopolies while sometimes you don’t confuses the public dialogue. When the dialogue is allowed to be confused with such inexplicable compromises of integrity the wrong side wins far too often in this world. We were at Tuesday’s Brooklyn Arena Local Development Corporation (“BALDC”) meeting where that authority approved the issuance of bonds to finance the proposed Atlantic Yards Nets basketball arena. 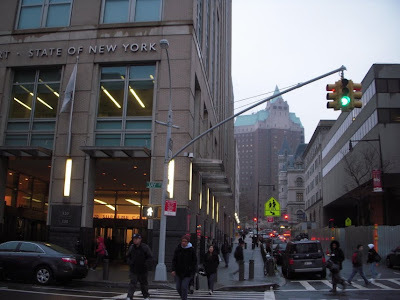 What is that agency in relation to the Empire State Development Corporation and its co-located sister agency, the New York State Job Development Authority? What makes it distinct? Or is it? Don’t ask unless you want to get into some needlessly byzantine distinctions that don’t exactly help the public understand or hold its government authorities accountable. If you do want to get into these distinctions and get an explanation for why this agency was trying to run off the radar without taking public comment or making information available ahead of time, read Atlantic Yards Report with all the gory details: Arena bonds authorization coming Tuesday: questions about transparency, PILOTs, and infrastructure spending remain (Monday, November 23, 2009). The case is also significant because it is the first major state supreme court defeat for property rights on a public use issue since Kelo. Over the last 10 years, the tide had been going the other way, with more and more state high courts applying restrictive definitions of “public use” and forbidding economic development takings of the kind upheld in Kelo, including important decisions in Ohio, Oklahoma, and Michigan, among others. Hopefully, Goldstein will not be the start of a counterrevolution. The people in the Empire State Development Corporation offices where the “BALDC” meeting was held were not gloating obscenely about the court decision. Why should they? They have nothing to be proud about. There is no reason to be proud of what they are trying to do at Atlantic Yards. They have no reason to be proud of the legal arguments offered to try to sustain their proposed abuse of eminent domain there and they have no reason to be proud of how they “won” the court decision which, because it consigns to the trash heap the protection of fundamental constitutional rights, has many people wondering if the decision in the state’s highest court was simply politically rigged like so much of what happens with Atlantic Yards. We will come back to spend some time on the “logic” (or lack of it) of the opinion offered by the court when it determined that the public should not be protected against politically connected developers. That will be in a later post. Here then are the visuals we held aloft at the meeting followed by the message we would have delivered if our comment had been allowed in words. 1. Why? Why are you financing something that will be $220 million net loss to the public? 2. 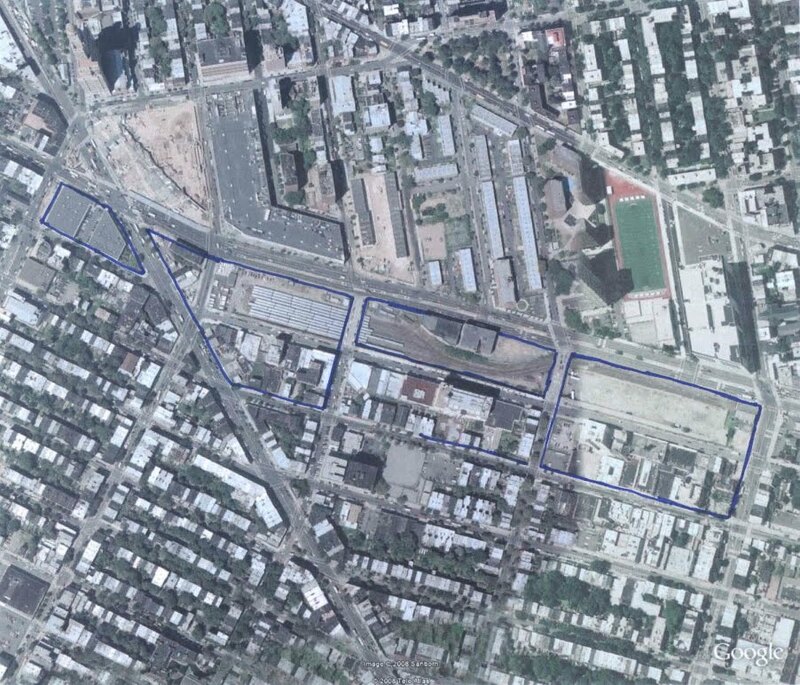 And what kind of net loss will the rest of the Atlantic Yards site be to the public? You don’t know because you haven’t done the analysis and you have set public up for a big net loss by giving the developer a monopoly on site development options, freely renouncing your negotiating power. 3. And why are you using the power of the government to consolidate Forest City Ratner’s monopoly on developing Brooklyn? Once upon a time the U.S. Supreme Court went out of its way to say that one of the rare purposes for which eminent domain could be used was to break up land that was overwhelmingly concentrated in the hands of a few private landowners. 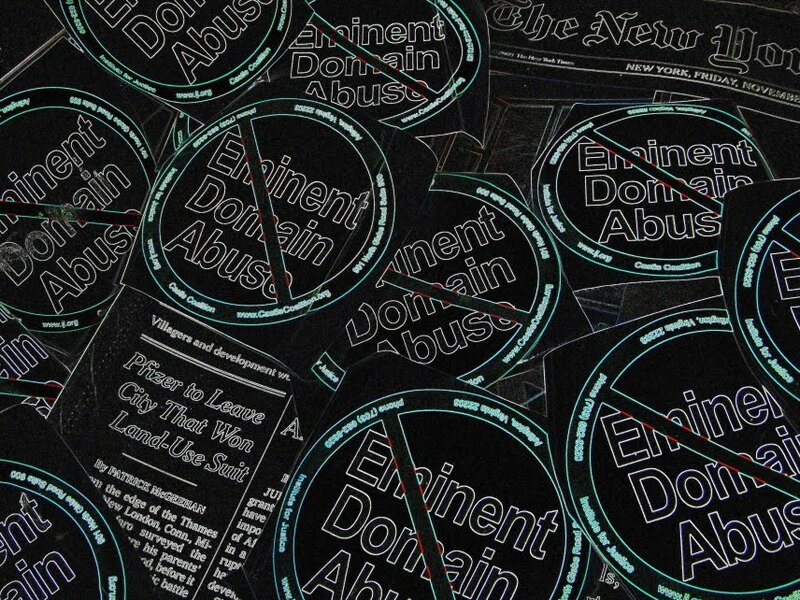 You are doing the opposite: Using eminent domain to artificially concentrate monopoly ownership in the hands of Forest City Ratner. 4. There are of course many questions to be asked about why you are issuing bonds with so many tell-tale loose ends. We could ask you why, for instance you aren’t reviewing and approving the involvement of Mikhail Prokhorov as a proposed principal in this transaction? 5. 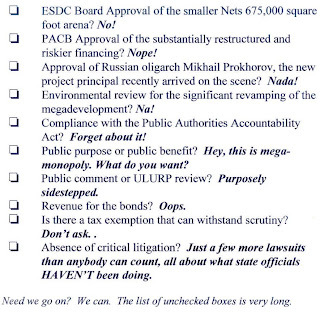 Of all the multiple loose ends that make this so transaction dangerous, perhaps the most important to ask you about is this: Why are you financing an arena that is different from the one that the ESDC board and the PACB actually approved and which will be so much more risk for the bondholders? You are financing an arena which, among other things is so much smaller that it won’t be able to host a second team playing hockey. 6. Of course, you should be worrying that these bonds will default and consequently don’t deserve a good rating. A default will negatively affect the market for all New York issuers. But that is not all you should be worrying about. Moody’s has warned that the entire state is weeks away from a substantial downgrade of its credit rating if it doesn’t close its budget gap. 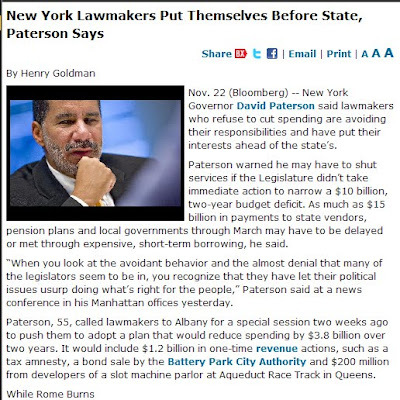 Governor Paterson is asking the legislature to take steps to close that gap but who can take the governor seriously when on his behalf you are still pursuing this supremely wasteful financing that is driving the state into a deeper financial hole. You are responsible for the misapplication of billions of public money to Atlantic Yards. 7. The consequence of your misconduct doesn’t end here. Sometimes the question comes up whether the most productive use of our time is to address the kind of misconduct and waste by public officials we see here or to turn instead to issues such as global warming that threaten the entire planet. There is really no distinction: The selfish pursuit of things that don’t make economic sense, that harm the larger community so that one company with too much political power can destructively get more than their fair share of the pie is all part the same bigger picture. 8. Sometimes sports stadiums and arenas are worth a lot less than the public pays for them. 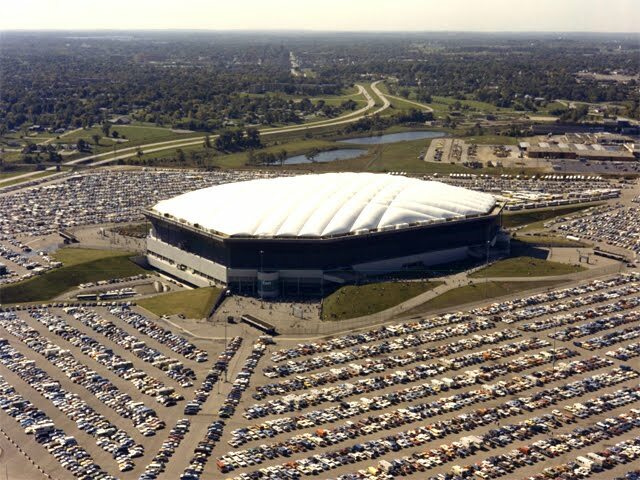 Above the Silverdome stadium that just sold at auction for less than the price of a one-bedroom apartment. Obviously the conclusion above provides an appropriate musical accompaniment to our slide show.- So now you have, pictures, words and a tune to hum. Before the meeting we were talking with one of the Goldman Sachs bankers involved in issuing the bonds, commenting that this must be the weirdest transaction on which they had ever worked. We were told that they had worked on some pretty weird transactions. We challenged them to name one as strange or involving so many oddities. Various other transactions were named. . . and discarded as candidates. We never came up with a transaction that even marginally approached being comparably strange. We commented that this transaction probably had within it every element of every weird deal that had been done anywhere else that strange things were going on in New York. Our banker mentioned that he sometimes tells people he does “Tutti Frutti” deals. Then he sighed, and perhaps realizing what was more apropos to this deal, he said, “Or I sometimes tell them I do `Rocky Road.’” “This,” we said certainly involves more than one scoop of “Rocky Road.” And god knows how many scoops of something else. After the board meeting was over there was a press conference where the Goldman Bankers and ESDC (“BALDC”) officials answered questions about the proposed issuance and marketing of the “Rocky Road” bonds. As Atlantic Yards Report reported, we asked about the fact that the bonds proposed to be issued are much riskier and are different from the financing approved by the ESDC board and the Public Authorities Control Board (“PACB”). The arena is significantly smaller, less functional and less capable of producing revenue, and much more revenue is going to be needed to pay for it because it is going to cost far more than the PACB was told. We thought it was interesting that Goldman bankers has said at the meeting that they were going to take the bonds out on “road show,” an atypical move that indicates to us that they view these bonds as an extreme version of “story bonds,” bonds that bondholders won’t feel comfortable buying based on what is in the offering statement unless it is supplemented with a lot of explanation, hand-holding and soothing about the transaction’s many ugly warts. Initially one of the Goldman Bankers, Marvin Marcus (as seen in one of the videos), tried to block our risk question put to another Goldman banker, Goldman Sachs Managing Director Gregory Carey, saying that Goldman only wanted to take questions from “the press.” The tactic seemed particular unfair given that Mr. Marcus had told us only a half-hour before that he had actually been reading our work. We had only left it undetermined where he had been reading what we write, in Noticing New York, the Huffington Post, the New York Sun, the Brooklyn Paper, or a consolidation with a pick-up of a Reuters story or somewhere else. Atlantic Yards Report commented that with our sometimes multiple hats, which involve not only writing commentary but also asking questions and asking for accountability by via activist tactics we may sometimes make it more difficult to get answers to our legitimate and tough questions. Acknowledged. We do give consideration about how to structure our role. Noticing New York is a truth-seeking, truth-exposing endeavor. The model for what we do is probably closest to Jane Jacobs, who wrote extensive commentary on urban events and at the same time used devices to illustrate and contrast her point of view with the point of view (and sometimes false facts) that stage-managed events attempt to promulgate. We don’t think there are easy answers to how to report on events about which one may have a point of view except to be honest in reporting one’s point of view. We will continue to think about this. Meanwhile we think our visuals present questions that need to be asked and answered. Goldman’s Carey responded to our question about the extra risk as you can see from the detailed Atlantic Yards Report account saying, among other things, that there was “less leverage on this transaction” than with respect to the old transaction. “Less leverage” is often a way to reduce risk in a transaction when it is being acknowledged to be riskier, so in a way that could be viewed as an indirect acknowledgment that the deal, as should be obvious, is riskier than the one that was approved by the PACB and the ESDC board, but Carey gave a bottom-line, on-script answer that “we actually view this as a much more secure transaction.” In our view, the PACB didn’t approve such “less leverage” fix-ups of a risky transaction. Mr. Carey did not himself offer a point of view on the PACB approval saying he wasn't familiar with what the PACB approved. What all this means is that although the bonds are issued by an authority that is a form of state agency, the bonds are non-recourse against the state itself, which means that the bondholders are at risk if these riskier bonds default. Because the state is not required to rescue defaulting bonds, it can technically walk away from them and it might. But if the state does walk away and lets the bondholders suffer when the bonds default, it will hurt the market for all New York State bond issuers, so the state may want to step in to prevent that from happening. Either way, the state takes a loss. That’s why the PACB was created to give prior review and approval to or prevent the kind of extra risky transactions that can provoke such problems from going out to market. Nevertheless, ESDC and BALDC want to avoid taking the inherently riskier transaction back to the PACB. 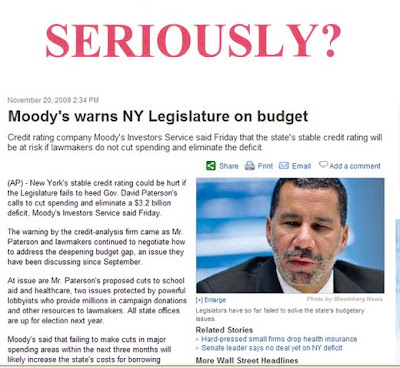 In fact, they don’t even want to answer questions about the risk they are exposing the state and te bondholders to. We asked the three PACB officials about the inherently more risky nature of this transaction involving a smaller, less functional arena than approved though it needs to somehow generate income to pay back a much higher construction cost. 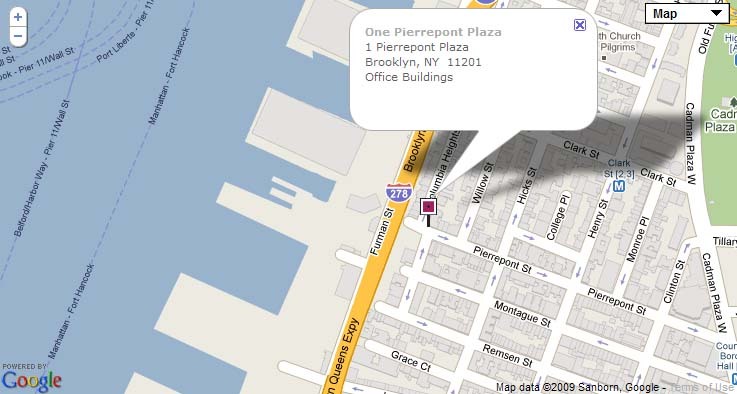 As Atlantic Yards Report details in its account, first they ignored me. Then they tried to avoid the question as not being from “accredited media.” Finally they walked away as we commented that we took this to mean that they had no response to our question about the greater and unapproved risk of the bond transaction the “BALDC” board had just authorized. If you want to see in video form much of what we would have said in presenting our images to the state officials uninteresting in taking comment go to this video from Atlantic Yards Report (the quality of the video is better if you click on the first version of the video below which is from the AYR post- original videography by Jonathan Barkey). If a city spends money on sports stadiums and arenas and doesn’t look after its economy it might just wind up so broke that it has to sell off the sports complexes it built. . . for a minuscule fraction of what it spent to build them. That appears to the lesson of the Pontiac Silverdome stadium, former home of the Detroit Lions, which was just auctioned off for an embarrassingly low price. If nothing else just look at all those parking spaces in the photo above and wonder what they are worth? Or what the parking spaces would be worth if they surrounded something valuable? Winner of Pontiac Silverdome auction revealed: Andreas Apostolopoulos of Triple Properties Inc. According to the Detroit News story above, the arena was “once called the most desirable property in Oakland County” and a quoted realty firm says the land itself “should have gone for more than that.” Apparently the arena was not considered worth its upkeep and the city of Pontiac was desperate to get the property “back on the tax rolls.” Sports stadiums and arenas on the tax rolls? There’s a novel concept that spendthrift New York City seems is absolutely unfamiliar with! What must the Michigan city have been thinking when it built its worthless Silverdome stadium? Was this just another case of public officials taking their eye off the economic ball due to sports euphoria. This is a very clear warning: The mysterious value of team spirit sports euphoria that cannot, and generally is not, economically quantified is in all likelihood economic value that just doesn’t exist at all. The overall lesson to be learned is how these sports stadium and arena deals terrifically shortchange the public with stadiums and arenas that have very low true economic value. There is one thing that will be different in New York when the city hits bottom with a mismanaged Bloombergian economy that has squandered its other economic opportunities: The city is setting it up so that it won’t have any sports stadiums and arenas to sell at a pittance when the economic day of reckoning comes; those stadiums and arenas will all still be in private ownership and they will all still be off the tax rolls. 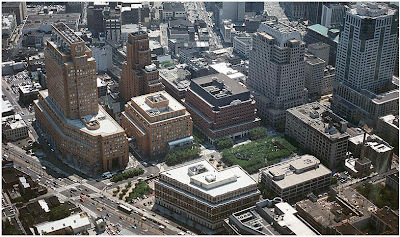 Atlantic Yards was birthed through the preclusion of allowing other developers to bid against Forest City Ratner for the site. Without that first step it never could have proceeded. The abuse of eminent domain was just a next step that was similarly about removing competition to complete the FCR monopoly. And, . . . . . the public cannot walk away. 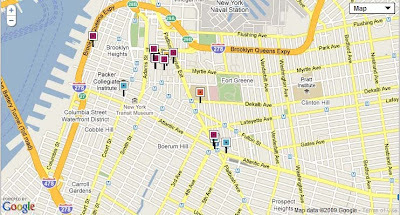 To assist in showing what we mean we thought we would supply some maps as visuals to demonstrate more about the exclusive control Ratner is seeking to establish involving strategic consolidations of much of Brooklyn’s most important real estate. The first of these visuals appears at the beginning of this post with a caption that explains which properties are which. 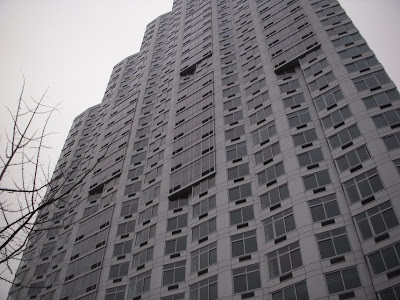 MetroTech is where Forest City Ratner’s foothold on monopolistic control of key Brooklyn real estate began. Anyone who doubts what Forest City Ratner is all about in regard to this kind of control should take a look at a January 1999 article that appeared, contemporaneously with some of the public relations hoopla of MetroTech coming on line. It appeared in the now defunct “Brooklyn Bridge” magazine. 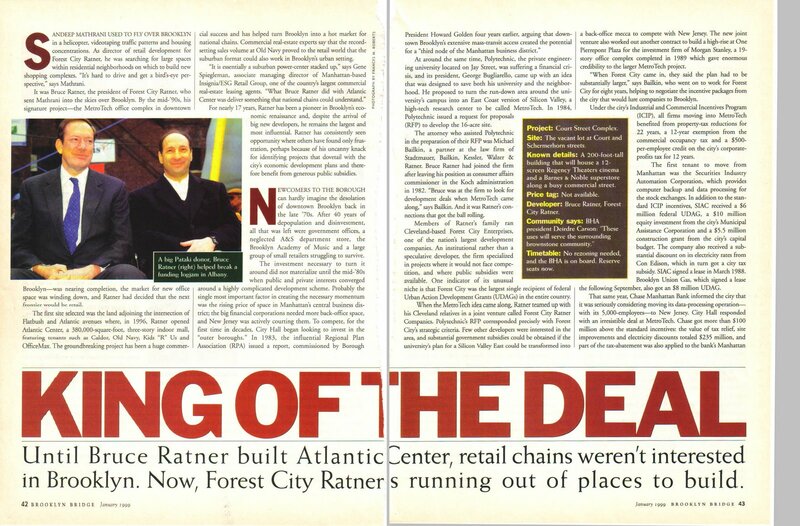 Atlantic Yards Report has written about the article, “King of the Deal” twice: Stadtmauer Bailkin, Bruce Ratner, and the web of subsidies (Friday, August 17, 2007) and Flashback, 1999: Developers, said FCR, must be "more creative" in finding sites (Thursday, August 23, 2007). Unfortunately, going back to 1999 there is no weblink to the article. 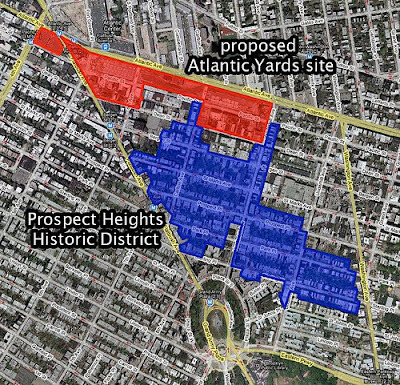 The image supplied here (of the first two pages- Click to enlarge) is from Atlantic Yards Report. “When Forest City came in, they said the plan had to be substantially larger,” said [attorney Michael] Bailkin, who went on to work for Forest City for eight years, helping to negotiate the incentive packages from the city that would lure companies to Brooklyn. That should sound familiar to those who have been paying attention to the Forest City Ratner exploits at Atlantic Yards. 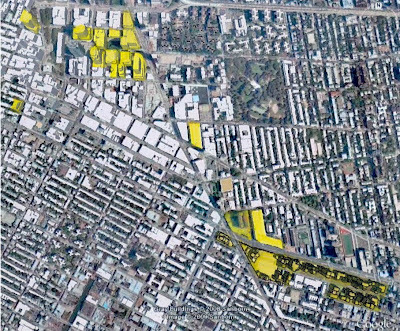 There has clearly been an operative strategy to make Atlantic Yards bigger than it needs to be both in terms of the site’s footprint and in terms of consolidating bulk onto that site through a zoning override. 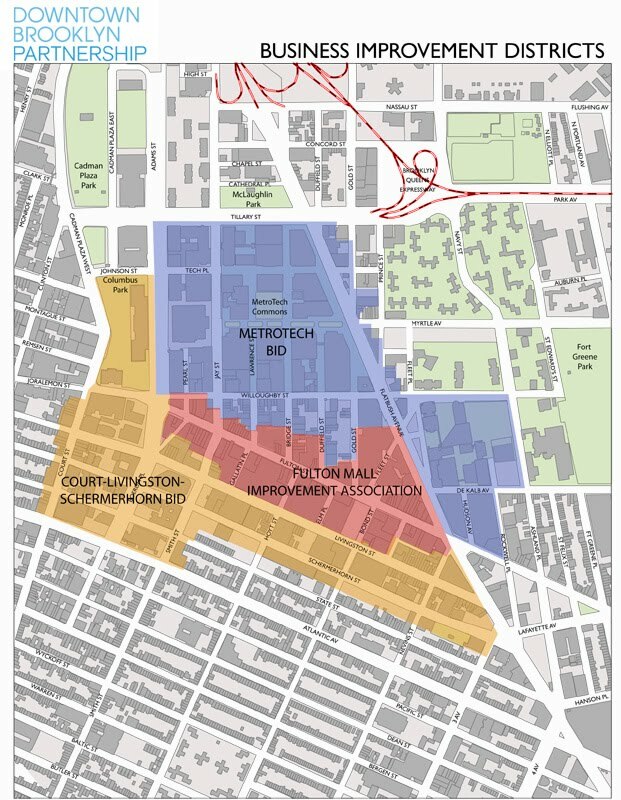 Among other things the Atlantic Yards plan involves the proposed condemnation and destruction of a block of buildings that there is no reason to destroy except that the site is being gerrymandered to please the developer’s desire to have more cheap land and a larger monopoly. An institutional rather than a speculative developer, the firm specialized in projects where it would not face competition and where public subsidies were available. One indicator of its unusual niche is that Forest City was the largest single recipient of federal Urban Action Development Grants (UDAGs) in the entire country. Elimination of Competition and Chasing Subsidies: “Rent Seeking”? There probably ought to be a law that no subsides should be handed out unless those subsidies can be competed for. There is no such law, but it is a desirable policy. Further, as the administration of Battery Park City demonstrates with its bidding out of individual development parcels to multiple developers, it is possible to have competition when large sites are developed. Also, the much higher proposed per dwelling unit amount of the housing subsidies proposed for Atlantic Yards demonstrates the inevitable result when there isn’t competition. Saying Aloha to Destructive Monopolies? It should be viewed as a significant irony that one of the most precedent-setting and conceptually challenging cases in which the U.S. Supreme Court dealt with eminent domain was Hawaii Housing Authority v. Midkiff, 467 U.S. 229 (1984) which held that Hawaii could use eminent domain to break up and redistribute to a wider population land that was overwhelmingly concentrated in the hands of a few private landowners. 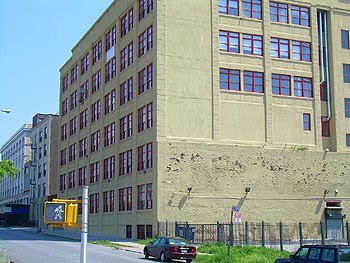 Now, in situations like Atlantic Yards and the Columbia University takeover of West Harlem eminent domain is being used for exactly the opposite, to artificially concentrate monopoly ownership of property in the hands of giant land owners such as Forest City Ratner and Columbia University, respectively. At the time MetroTech began, Bruce Ratner was a partner at the law firm of Stadtmauer Bailkin LLP. One of the two Atlantic Yards Report articles that wrote about the “King of the Deal” story focused specifically on how the law firm of Stadtmauer Bailkin LLP, specializes in the large-scale extraction of special subsidies from New York and using the firm’s website Atlantic Yards Report itemizes many of the subsidies the firm was involved in procuring for MetroTech. “Bruce was at the firm [Stadtmauer Bailkin LLP.] 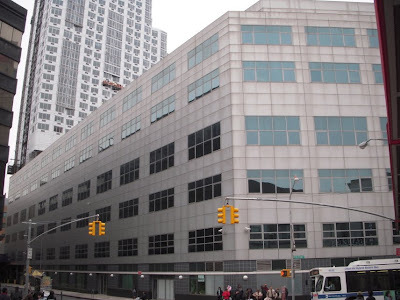 to look for development deals when MetroTech came along,” says Bailkin. And it was Ratner’s [Koch administration] connections that got the ball rolling. 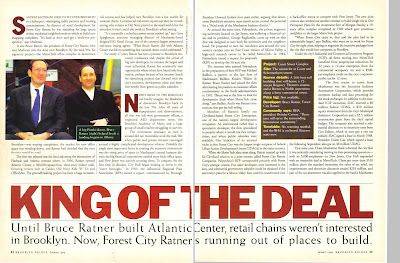 The “King of the Deal” article begins with a description of how, when MetroTech was nearing completion, Ratner assigned one of his real estate development directors the job of flying over Brooklyn in a helicopter “videotaping traffic patterns and housing concentrations” searching for a location to build new shopping complexes that eventually became the Atlantic Center mall in 1996 followed by then the adjoining Atlantic Terminal mall. 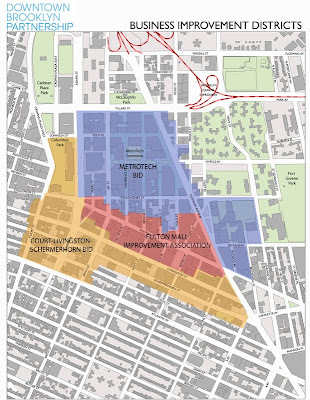 Atlantic Yards is envisioned as an another immediately adjoining extension to those properties. 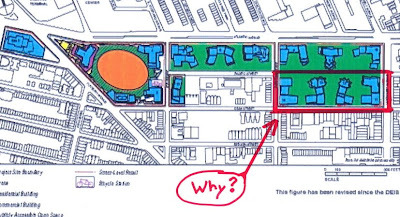 The fact that Ratner was looking at street traffic patterns and likely located the malls at the significant convergence of traffic he found at the intersection of Atlantic Avenue and Fulton Street may be viewed as dismaying news to neighborhood residents who are looking at the fact that Ratner now wants to put a traffic-surge generating basketball arena at the very same site together with many blocks of traffic-attracting parking. While Ratner, a boy from Cleveland, apparently had a real estate director looking at Brooklyn’s vehicular surface traffic way back then, in New York, what is much more important is where the subway lines are. 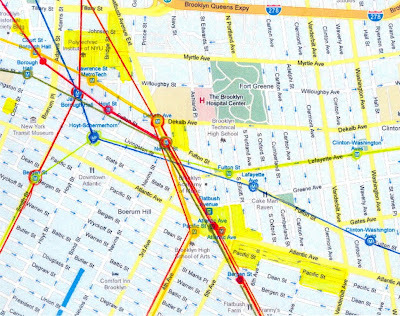 We generated another map showing subway lines because the influence of subways is one several things that effectively make more pronounced the real estate monopolies that Ratner is pursuing. To look at how effectively troubling a real estate monopoly is, one should not look at just at site acreage. One should also look at the density and size of the buildings in question, not only in terms of what exists and has been built but also in terms of what can be built. 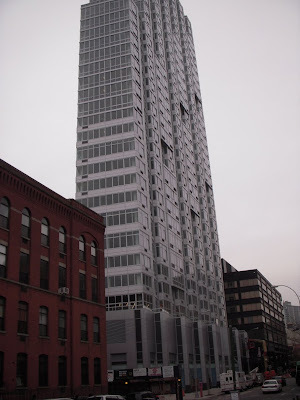 When looked at next to their neighboring structures the Ratner buildings dominate in size. Secondly, one should look at the relative value of that land and its practical proximity when traveling to other real estate. 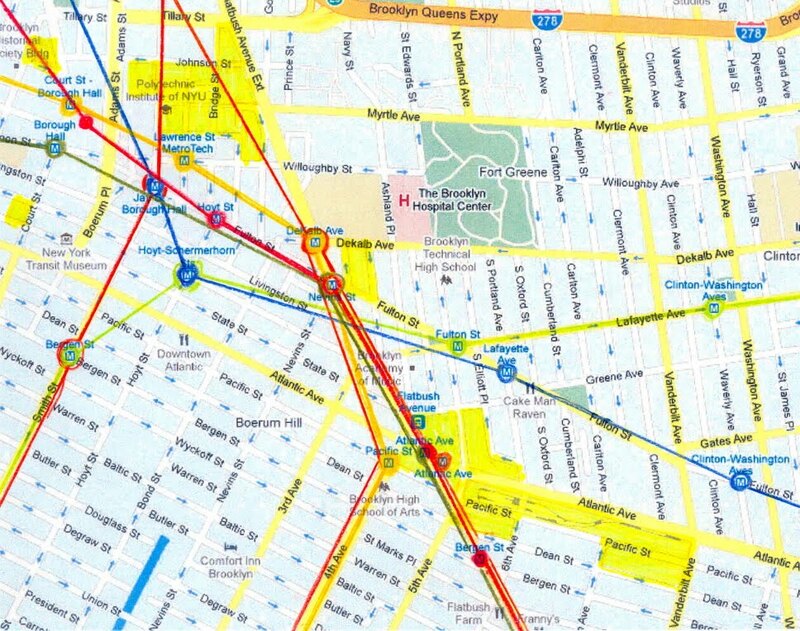 In those terms we find that the Ratner sites are dominating the subways lines too. See the map with city subway lines overlaid below. 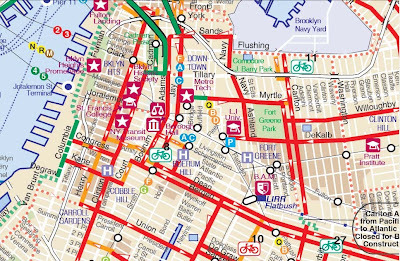 (Below that, as second reference on this is a DOT bicycle map that shows subway lines.) In other words the Ratner monopoly is more significant than might immediately be apparent. 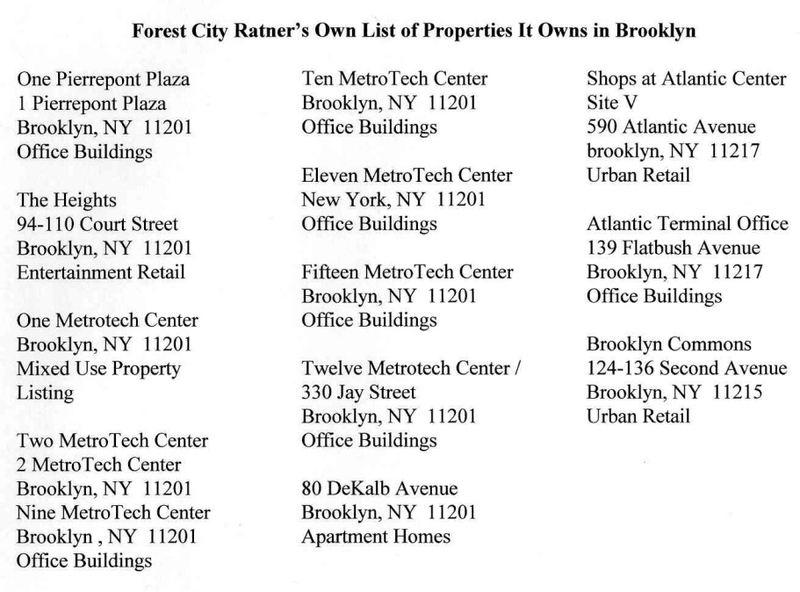 To be fair, it is not easy to provide a map of Forest City Ratner’s dominance of Brooklyn real estate that provides all the information one might want to see to assess the situation. For instance. 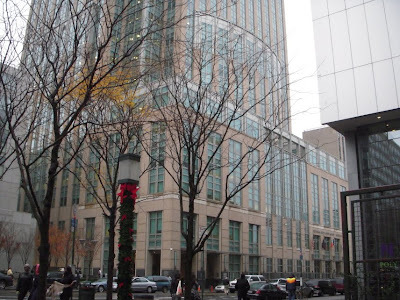 although Forest City Ratner’s website provides an image of MetroTech (above) that thrusts forward with relative prominence the two Chase Bank buildings (MetroTech addresses 3 and 4), those two buildings are not actually owned by Forest City Ratner. 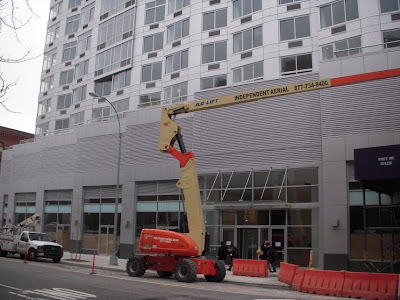 They are at least nominally owned by a city development agency, which ownership is probably tied in with the delivery of subsidies the two buildings receive. 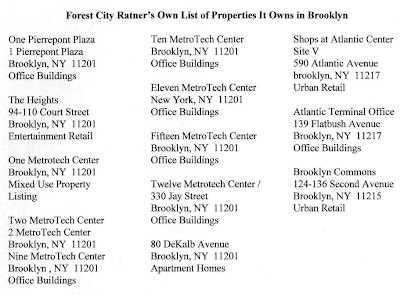 Accordingly, the Forest City Ratner website page (that allows visitors to zoom in and out on a map to view properties listed as owned by Forest City Ratner) omits these properties (see below). The website is not perfectly accurate: It puts One Pierrepont Plaza at the wrong end of Brooklyn Height’s Pierrepont Street rather than much closer to MetroTech on the side of Cadman Plaza (see below). With little overlapping pins, it also doesn’t give an idea of the expanse of the Forest City ownership. Below is a list of addresses the Forest City website lists as owned (it doesn’t get into the Atlantic Yards properties). Below that is a map of MetroTech with MetroTech addresses. 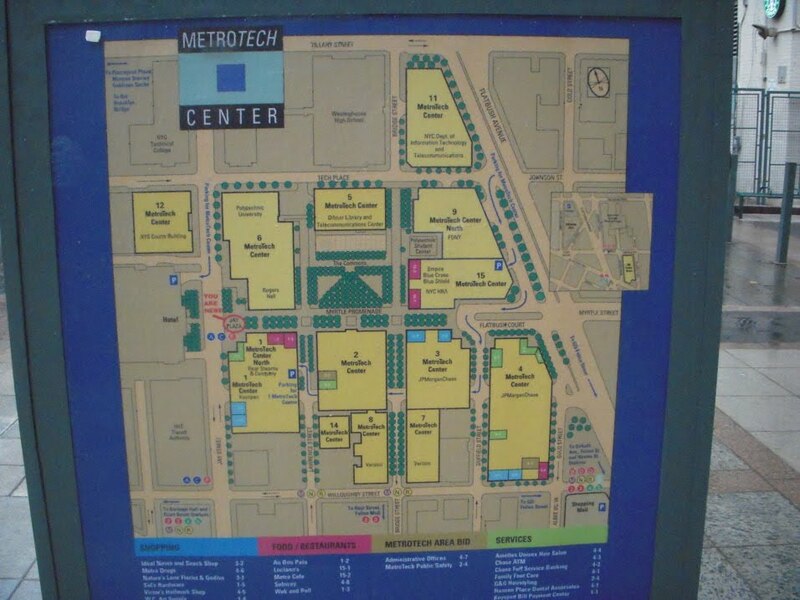 It doesn’t show 10 MetroTech Center. If you ask about it, the security guard will be confused. Keep reading. 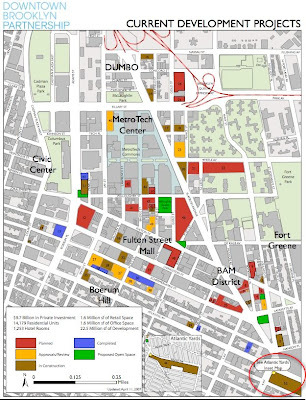 Below is a version of our original map that highlights in MetroTech only those properties that the Forest City Ratner website lists as owned by the firm. If anything, showing the Ratner ownership at the MetroTech site as a reduced amount only emphasizes the proportionately greater ownership of Brooklyn real estate to which Forest City Ratner wishes to surge through exclusive ownership of Atlantic Yards. It is possible that the vanity address (that is the way Ratner himself referred to it) of 10 MetroTech Center (see building above) is a long-ago clue to Ratner’s ambitions for much more city-assisted ownership in this area. Perhaps he is looking forward to one continuous end-to-end swath. Ratner has since gone on to build adjacent 36-story 80 DeKalb residential building (see blow). Looking at the building’s size in relation to its neighbors is a reminder that, as we already made the point, it is important to consider relative size in evaluating dominance. 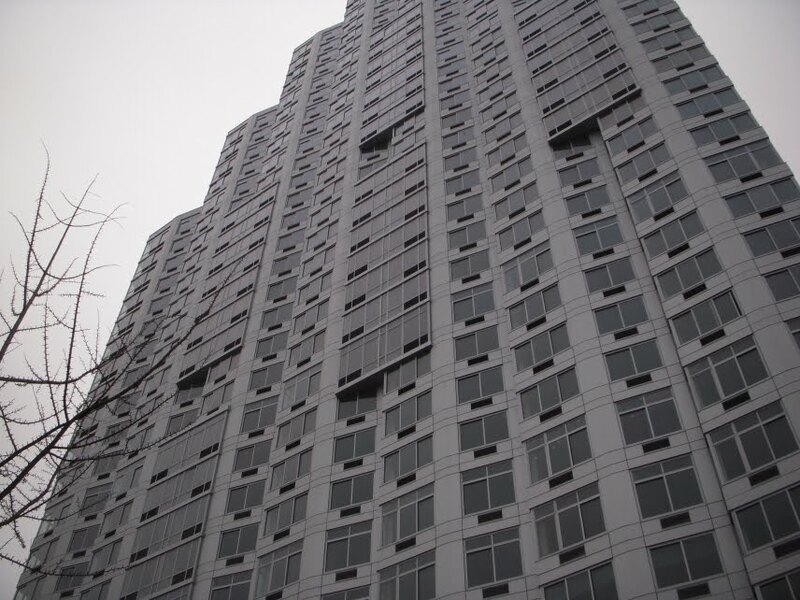 Financing for 80 DeKalb was provided when scarce subsidizing tax-exempt housing bonds were provided to it by the New York State Housing Finance Agency. One would hope that the developer did not, as it typically does, use political influence to obtain preferential access to that subsidy. 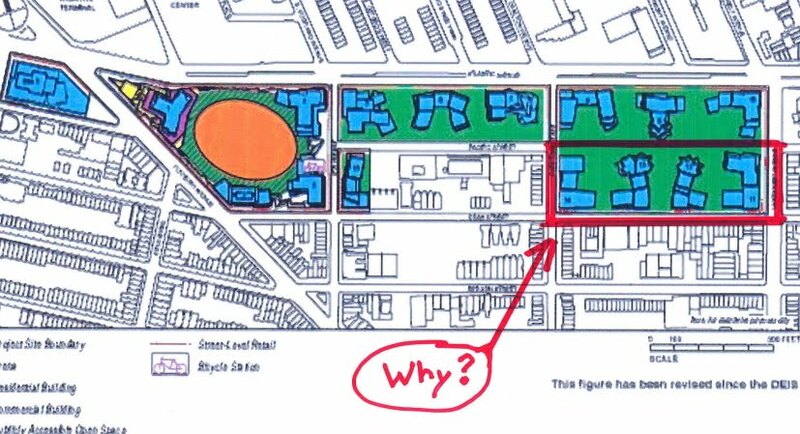 If anything, the proposed Ratner monopolistic total control over the development of the Atlantic Yards site is a more disproportionate addition to Ratner’s Brooklyn holdings than one might expect because Forest City Ratner would own more of it and because it is all upcoming development. It is also disproportionately greater because of the extraordinary extra density being piled onto the site, significantly more than at MetroTech. 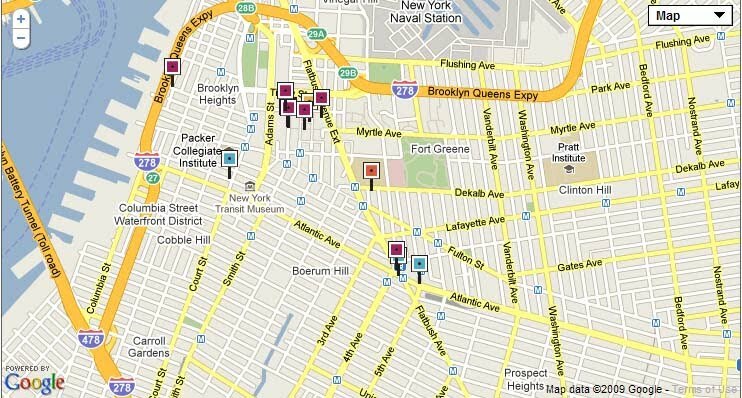 The terms of the ludicrous so-called economic benefits agreement that ACORN signed with Ratner called for ACORN to support Ratner’s monopoly control of “7.799 million square zoning feet for the project.” (See: Saturday, June 28, 2008, Selling out the Community for Beans (A Giant Wrong).) 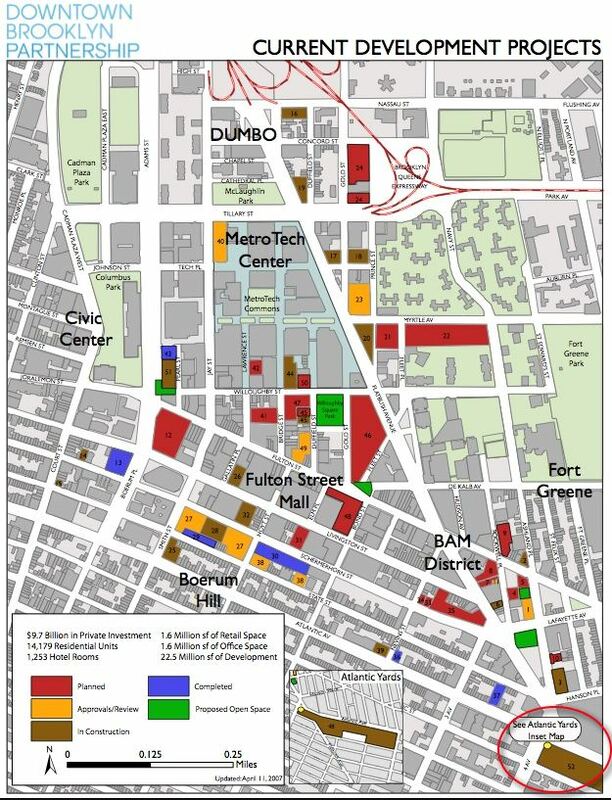 On a square footage of land site control basis alone, this is a substantial portion of all the development that shows up on the Downtown Brooklyn Partnership’s map of “Current Development Projects” (see below). Only a small portion of the “handle” of Atlantic Yards’ wrench-shaped site peeks in onto that map but that “tip of the iceberg” portion looks huge compared to the rest of the development on the map. 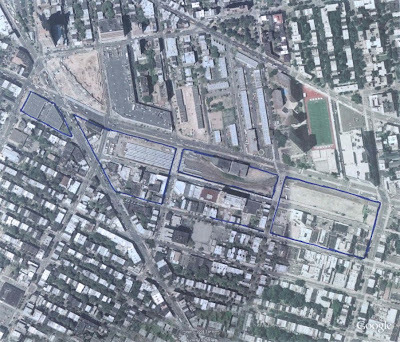 The map manages to show the rest of the Atlantic Yards site by shrinking the mega-project down to a minuscule fraction of its actual size, perhaps a ninth, where one block normal city length equals then three of the comparatively diminutive AY block lengths. We conclude simply with this. If monopolies have always been recognized to be bad, such that we have national laws against them, and if monopolies facilitate “rent seeking” behavior that enables developers like Forest City Ratner to manipulate gains for itself at society’s loss, why is the government fostering these real estate monopolies for one real estate company’s unprecedented takeover of so much of Brooklyn? It doesn’t make sense to us but it’s a really BIG question. We hope that our mapping it out helps to visualize just how big. 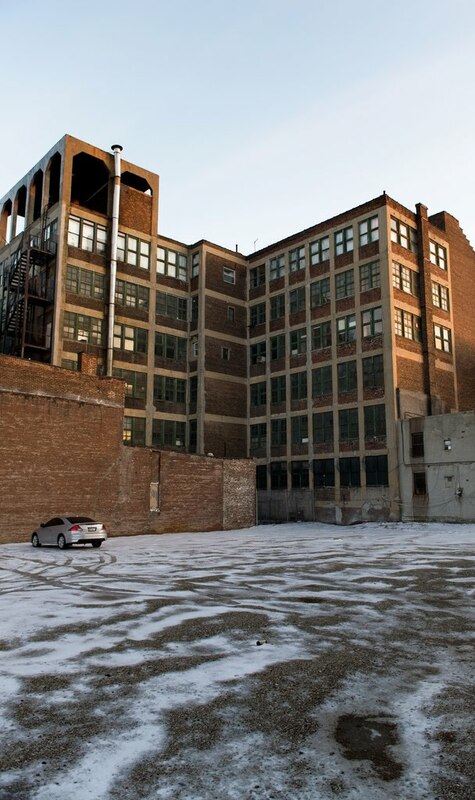 Though Jane Jacobs did not dwell on it she certainly thought that in worst case scenarios eminent domain would be wielded not just out of misguidance but with greed as an operative factor. In the first pages of her book she quotes from the Old Testament’s Job talking about reaping fields and stripping of vineyards wrongfully seized and not properly owned. That possibility raises the moral stakes of the question. But in a realm such as eminent domain where power to seize financial wealth is vast and where the air is clouded by the murk of mistakes, it is highly appropriate to be on guard for the way that greed can propel error beyond honest mistake. Looking at the proposed Atlantic Yards it is virtually certain that naked greed is an operative factor in how eminent domain is being used. It cannot be regarded as an accident that the planning of the footprint was the megadeveloper’s own work. 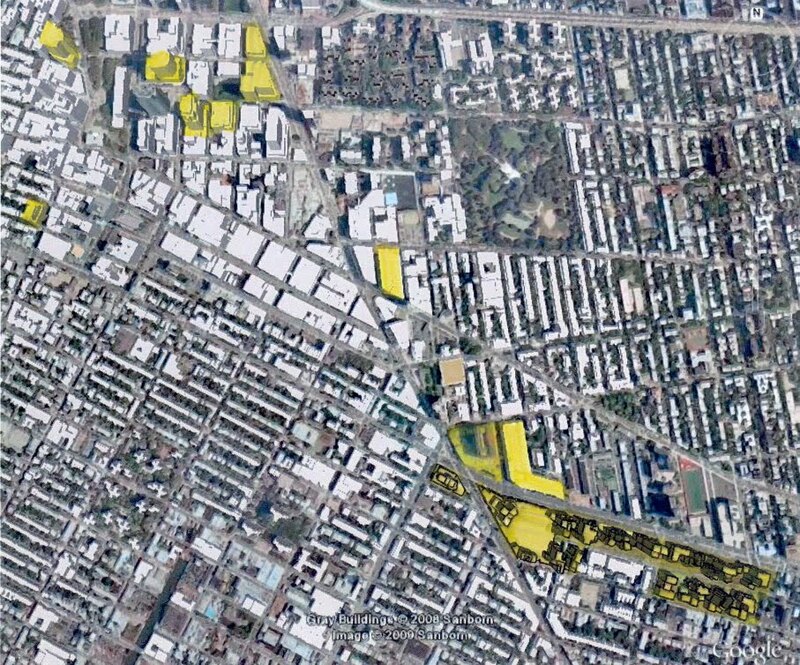 Furthermore, the peculiar wrench-shape footprint of the project highlights that the way in which eminent domain is being used is suspiciously odd. 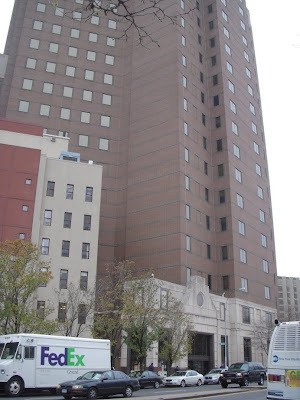 The shape of the footprint emphasizes how one block, the Ward Building block, is being condemned for little or no good ostensible purposes, while next to it the footprint curves around to avoid condemning an adjacent block with very similar characteristics. 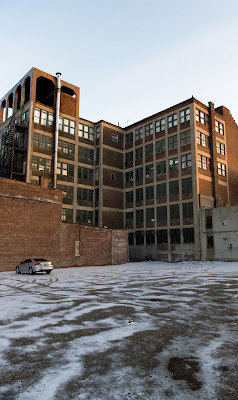 The adjacent block not being condemned involves ownership by a developer who has political relationships and who was in another set of negotiations with the official public agency supposed to be doing the condemnations at approximately the time the footprint was established. It is probably not an accident that Ward block which has probably the least reason to be condemned on an allocable basis may yield the greatest net profit because construction on it does not involve the expense of building a platform. 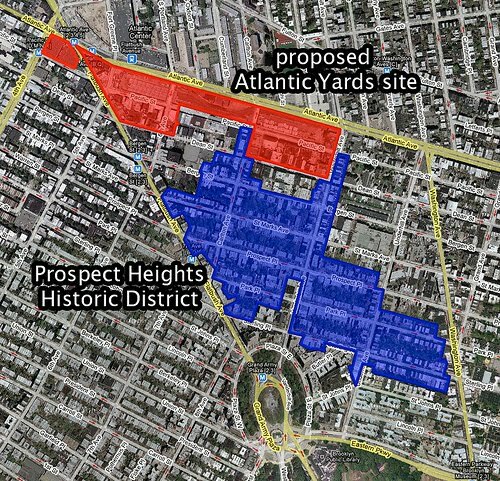 In the case of Atlantic Yards, eminent domain is being used as a tool to establish a no–bid mega-monopoly. 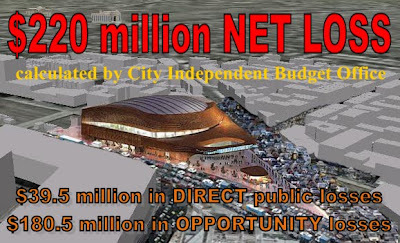 The developers’s (and assisting agencies’) immediate priority is to build an arena that will be a $220 million net loss for the public. Recent disclosures have made it clear that the mega-monopoly being given to developer Forest City Ratner entitles the developer to have control over land being seized by eminent domain without building anything on it for decades even though the land was taken out of the hands of active, currently building developers. In fact, even though Forest City Ratner is being given this mega-monopoly, even though they are making haste to tear down useful existing buildings, they may actually build nothing on much of the land in the end since Forest City Ratner is essentially being given an option on that land without a corresponding obligation to build. All these things clearly bespeak greed.